Lumbricus rubellus is a medium sized epi-endogeic earthworm that is native to Europe. It is one of the most widespread earthworm invaders in the world and has invaded parts of Canada, United States, South America, Russian Federation and several sub-Antarctic islands. The combined impacts of this species and other exotic earthworms are having profound effects on forest ecosystems in North America, particularly in regions which lack native earthworms. Exotic earthworms rapidly consume leaf litter, thereby altering nutrient cycling and availability and other soil properties. This has cascading effects on microbial communities, invertebrates, vertebrates and seedling establishment, and may alter entire plant communities and threaten rare plant species. Lumbricus rubellus is a medium sized (10-15 cm) partially pigmented epi-endogeic worm. Mean biomass is reported to be 1.89 g (Wironen & Moore, 2006; Hendrix & Bohlen, 2002). Lumbricus rubellus is an important commercial fishing bait species (Addison, 2009; Keller et al., 2007). It has also been identified as a potentially useful species for the breakdown of organic wastes. However it is a relatively slow growing species, and further research into its potential in vermicomposting is needed before its major adoption for this purpose (Edwards & Arancon, 2004). In agricultural systems and natural systems adapted to earthworms, they provide important ecological services including improvement of soil properties (e.g. ., nutrient turnover, soil structure and water flow, pH, functional biodiversity, food sources for vertebrate predators) and increasing plant production. Indeed earthworms have been deliberately introduced to pastures, landfills and reclaimed mite sites in several countries around the world to improve agricultural productivity and minimise soil degradation (Baker et al., 2006). Lumbricus rubellus is common in coniferous forests in its native European and introduced North American range (Addison, 2009). It has also been documented to thrive in riparian zones characterized by high soil moisture and compacted soils, thought to present challenging conditions for earthworms (Costello & Lamberti, 2008). It feeds on the surface litter but also burrows and produces casts in the upper mineral soil layer, and is found intimately associated with plant roots, suggesting that this species actively feeds in the rhizosphere (Hale et al., 2008). It is relatively frost tolerant (Tiunov et al., 2006), and thrives in soils with low pH (range 3.0-7.7) (Wironen & Moore, 2006). Troglophilic (cave-dwelling) behaviour has been observed in L. rubellus in Alabama, Georgia, South Carolina and Tennessee (Reeves et al., 1999). Lumbricus rubellus is not parthenogenic, and thus only reproduces sexually (Hendrix & Bohlen, 2002). Evans & Guild (1948 in Dymock et al., 1997) reported production of 106 cocoons/per individual in a laboratory culture. Lumbricus rubellus is an epi-endogeic species. It inhabits and feeds in the litter and organically enriched surface layers of soil. Epigeic species facilitate the breakdown and mineralisation of surface litter (Hendrix & Bohlen, 2002). Epigeic species tend to possess more cellulase enzymes than anecic or endogeic earthworms, reflecting their diet of relatively undecomposed organic matter (McLean et al., 2006). Earthworms, especially Lumbricus species have high calcium demands and strong litter calcium preferences (Reich et al., 2005 in Holdsworth et al., 2008). Their high calcium demands may be necessary to supply their well developed calciferous glands, which produce calcium carbonate that could moderate blood CO2 levels and pH when soil pCO2 levels are elevated (Holdsworth et al., 2008). Calcium content of litter is thus a predictor of litter preference among earthworms, and consequently decomposition rates and litter mass loss (Holdsworth, 2006 in Holdsworth et al., 2008). Recommended citation: Global Invasive Species Database (2019) Species profile: Lumbricus rubellus. Downloaded from http://www.iucngisd.org/gisd/species.php?sc=1711 on 19-04-2019. Exotic earthworms are a particular problem in previously earthworm-free temperate and boreal forests of North America dominated by Acer, Quercus, Betula, Pinus and Populus (Frelich et al., 2006). Earthworms are often classified based on their activity and feeding type, which affects their impacts on the soil (Bouché, 1977 in Addison, 2009). Dendrobaena octaedra and Dendrodrilus rubidus are epigeic species, which inhabit and feed at the soil surface. Epigeics physically disrupt the organic layer of the soil by consuming and mixing the F and H layers, producing a homogenous and granular form of organic forest floor (Addison, 2009). Lumbricus rubellus operates in two categories, 1) epigeic which inhabit and feed at the soil surface and 2) endogeic which live and feed in the mineral horizons below the organic (LFH) layer. Thus it is considered epi-endogeic in its habits, feeding on organic matter in the forest floor, but also mixing the organic material into the upper layer of mineral soil (Addison, 2009). L. terrestris is a deep-burrowing anecic earthworm, which create permanent vertical burrows in the mineral layer. They come to the surface to feed on litter and pull it down to their burrows, depositing casts of mixed organic and mineral material on the soil surface (Addison, 2009). Thus earthworms in different functional groups have different impacts on the soil (Frelich et al., 2006; Hale et al., 2008). Often multiple earthworm species inhabit areas of forest, and studies suggest that impacts are greater when earthworms from more than one functional group occur together (Hale et al., 2005; Hale et al., 2008). Earthworm invasions typically occur in waves (e.g. Hendrix & Bohlen, 2002; Eisenhauer et al., 2007), with epigeic (e.g. D. octaedra, D. rubidus) or epi-endogeic (e.g. L. rubellus) species arriving first as they are able to utilise undisturbed forest floors. The first noticeable impacts tend to be physical disruption of the stratified humus layers on the forest floor. Endogeics generally only invade after the organic layer has been modified by epigeic or epi-endogeic species. Anecic species (e.g. L. terrestris) are usually last to arrive (James & Hendrix, 2004 in Addison, 2009). The purported impacts of invasive earthworms are often varied between publications, and different soil types and soil layers may be affected differently by earthworm invasion. However the main effect of earthworms is to consume litter, and incorporate it into deeper soil layers, thus causing mixing of the A and O soil horizons. This causes extreme reduction of the litter layer and changes in nutrient concentrations and cycling in the soil. Other soil characteristics such as pH, porosity and decomposition rates may also be affected. Physical disruption of plant roots and mycorrhizal associations is also a common impact. These changes to fundamental soil properties have cascading effects on plant communities, microorganisms, micro and mesofauna, birds and mammals (Hale et al., 2008; Addison, 2009). For a detailed account of the impacts of invasive earthworms please read Earthworms Impacts Information. There are currently no effective methods to eradicate established earthworm populations without unacceptable non-target effects. Thus the main technique for managing invasions is prevention of introductions, via various pathways (Cameron et al., 2007; Keller et al., 2007). Preventative measures: One of the major pathways for earthworm introductions is believed to from release by anglers discarding unwanted live bait. Keller et al. (2007) suggest two alternatives to reduce the likelihood of further establishments while preserving the economically important live trade of earthworms. These are: 1) Replace the species currently sold with earthworm species that are unlikely to establish populations, e.g. Eudrilus eugeniae which has an extremely low invasion risk in the U.S. Midwest, and 2) Strengthen efforts to educate anglers to dispose of live earthworms responsibly, i.e. in the trash where landfill conditions are likely to kill them (Keller et al., 2007) or to prohibit the abandonment of live bait (Cameron et al., 2007). Similarly, transport of cocoons and earthworms via vehicular transport is a major pathway for introduction to new locations. Thus construction of fewer roads, restricting the amount of traffic on roads or reclaiming roads where possible would minimize spread of earthworms (Cameron & Bayne, 2009). Management and regulatory strategies should also take into account the fact that some earthworm species, such as Lumbricus rubellus have larger impacts than others. This species is less widely distributed than other exotic species. Thus preventing its introduction to new areas is important, even if those areas are already infested with other species (Hale et al., 2006). Similarly, some forests will be more susceptible to invasion than others. Litter calcium content is likely to be an important predictor of litter decomposition rates by exotic earthworms (Holdsworth, 2008). Callaham et al. (2006) suggest various policy measures that could be adapted to prevent the spread of exotic earthworms. The authors suggest restrictions on transportation of soils from infested areas to non-infested areas, unless a special permit certifying that the material is free from earthworm propagules has been granted. Formalized earthworm introduction decision making tools are also recommended as an alternative to the ad hoc decisions made by regulating agencies at present. This decision-making process allows for the quarantine of materials containing propagules of earthworms that have not been identified or widely introduced previously. These quarantines would provide time to determine the ecological risk posed by the introduction of a given earthworm species into particular systems. Suggested types of information needed to determine ecological risk include mode of reproduction, number of embryos per cocoon, ecological “strategy”, and temperature, pH and moisture requirements (Callaham et al., 2006). Cultural measures: Successful establishment of earthworm populations is influenced by management of the site. For example, synergistic effects of the invasive weed buckthorn and exotic earthworms could be minimized by early control measures to limit the weed (Heneghan et al, 2006). Chemical control: Where non-native earthworms are not well established or are found in discrete populations, the use of chemical treatments to eradicate undesirable worms may be successful. Chemical control have been used in the management of golf courses. While these treatments are highly effective, the non-target effects of chemicals should be examined before large-scale utilization (Callaham et al., 2006). Informations on Lumbricus rubellus has been recorded for the following locations. Click on the name for additional informations. Cameron, Erin K.; Bayne, Erin M.; Clapperton, M. Jill, 2007. Human-facilitated invasion of exotic earthworms into northern boreal forests. Ecoscience. 14(4). 2007. 482-490. Hendrix F. Paul (Ed). 2006. 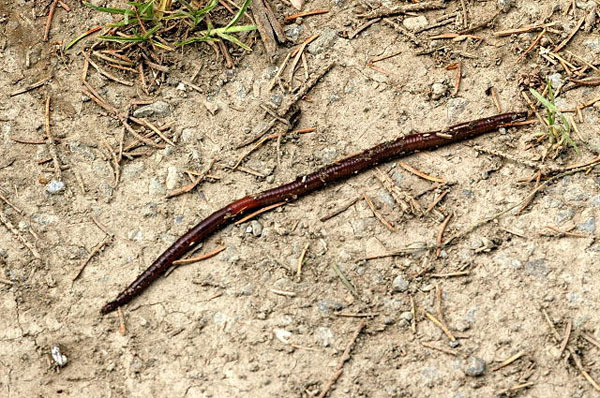 Biological invasions belowground earthworms as invasive species. SpringerLink Dordrecht, Netherlands: Springer. Keller, Reuben P.; Cox, Annie N.; Van Loon, Christine; Lodge, David M.; Herborg, Leif-Matthias; Rothlisberger, John, 2007. From bait shops to the forest floor: Earthworm use and disposal by anglers. American Midland Naturalist. 158(2). OCT 2007. 321-328. Al-Yousuf S. & Hagras A E W , 1986. On the Earthworm Fauna and Distribution in the State of Qatar. Qatar University Science Bulletin. 6 1986. 247-254. Baker, G. H.; Thumlert, T. A.; Meisel, L. S.; Carter, P. J.; Kilpin, G. P., 1997. Earthworms downunder : A survey of the earthworm fauna of urban and agricultural soils in Australia. Soil Biology & Biochemistry. 29(3-4). 1997. 589-597. Berman, D. I., E. N. Meshcheryakova, A. N. Leirikh. 2010. Egg Cocoons of the Earthworm Dendrodrilus rubidus tenuis (Lumbricidae, Oligochaeta) Withstand the Temperature of Liquid Nitrogen.Doklady Biological Sciences. 434. MAY 2010. 347-350. Blakemore, R. J. 2003. Japanese earthworms (Annelida: Oligochaeta): a review and checklist of species. Org. Divers. Evol. 3, Electr. Suppl. 11: 1 - 43. Blakemore, R.J. 2008b. British and Irish earthworms - a checklist of species updated from Sims & Gerard (1999). Costello, David M.; Lamberti, Gary A., 2008. Non-native earthworms in riparian soils increase nitrogen flux into adjacent aquatic ecosystems. Oecologia (Berlin). 158(3). DEC 2008. 499-510. Damoff, George Alan; Reynolds, John Warren, 2009. The Earthworms (Oligochaeta: Acanthodrilidae, Eudrilidae, Lumbricidae, Megascolecidae, Ocenerodrilidae, and Sparganophilidae) of East Texas, USA. Megadrilogica. 13(8). OCT 2009. 113-140.
de Mischis, Catalina C.; Gleiser, Raquel M., 1999. First record of oligochaete fauna (Annelida, Oligochaeta) from the Province of La Rioja, Argentina. Megadrilogica. 7(9). July, 1999. 61-64. Dymond, P., S. Scheu, and D. Parkinson. 1997. Density and distribution of Dendrobaena octaedra (Lumbricidae) in aspen and pine forests in the Canadian Rocky Mountains (Alberta). Soil Biology and Biochemistry 29:265�273. Edwards, C.A. & Arancon, N.Q. 2004. The Use of Earthworms in the Breakdown of Organic Wastes to Produce Vermicomposts and Animal Feed Protein. In. C.A. Edwards (Ed). Earthworm Ecology (pp. 45�379). CRC Press. Eisenhauer, Nico; Partsch, Stephan; Parkinson, Dennis; Scheu, Stefan, 2007. Invasion of a deciduous forest by earthworms: Changes in soil chemistry, microflora, microarthropods and vegetation. Soil Biology & Biochemistry. 39(5). MAY 2007. 1099-1110. European Environment Agency. Undated C. Lumbricus rubellus. Gonzalez, Grizelle; Seastedt, Timothy R.; Donato, Zugeily, 2003. Earthworms, arthropods and plant litter decomposition in aspen (Populus tremuloides) and lodgepole pine (Pinus contorta) forests in Colorado, USA. Pedobiologia. 47(5-6). 2003. 863-869. Greiner, Holly G.; Costello, David M.; Tiegs, Scott D., 2010. Allometric estimation of earthworm ash-free dry mass from diameters and lengths of select megascolecid and lumbricid species. Pedobiologia. 53(4). 2010. 247-252. Gundale, Michael J., 2002. Influence of exotic earthworms on the soil organic horizon and the rare fern Botrychium mormo. Conservation Biology. 16(6). December 2002. 1555-1561. Hale, Cindy M.; Frelich, Lee E.; Reich, Peter B., 2005. Exotic European earthworm invasion dynamics in northern hardwood forests of Minnesota, USA. Ecological Applications. 15(3). JUN 05. 848-860. Hale, Cindy M.; Frelich, Lee E.; Reich, Peter B., 2006. Changes in hardwood forest understory plant communities in response to European earthworm invasions. Ecology (Washington D C). 87(7). JUL 2006. 1637-1649. Hale, Cindy M.; Frelich, Lee E.; Reich, Peter B.; Pastor, John, 2008. Exotic earthworm effects on hardwood forest floor, nutrient availability and native plants: a mesocosm study. Oecologia (Berlin). 155(3). MAR 2008. 509-518. Heneghan, Liam; Steffen, James; Fagen, Kristen, 2006. Interactions of an introduced shrub and introduced earthworms in an Illinois urban woodland: Impact on leaf litter decomposition. Pedobiologia. 50(6). 2006. 543-551. Holdsworth, Andrew R.; Frelich, Lee E.; Reich, Peter B., 2008. Litter decomposition in earthworm-invaded northern hardwood forests: Role of invasion degree and litter chemistry. Ecoscience. 15(4). 2008. 536-544. Marshall, Valin G.; Fender, William M., 2007. Native and introduced earthworms (Oligochaeta) of British Columbia, Canada. Megadrilogica. 11(4). AUG 2007. 29-52. McAlpine D. F. Reynolds J. W., 1977. Terrestrial Oligochaeta of some New Brunswick Cana Caves with remarks on their ecology. Canadian Field-Naturalist. 91(4). 1977. 360-366. McLean, M. A., and D. Parkinson. 1997a. Changes in structure, organic matter and microbial activity in pine forest soil following the introduction of Dendrobaena octaedra (Oligochaeta, Lumbricidae). Soil Biology and Biochemistry 29:537�540. McLean, M. A., and D. Parkinson. 2000a. Field evidence of the effect of the epigeic earthworm Dendrobaena octaedra on the microfungal community in pine forest floor. Soil Biology and Biochemistry 32:351�360. McLean, M. A., and D. Parkinson. 2000b. Introduction of the epigeic earthworm Dendrobaena octaedra changes the orabatid community and microarthropod abundances in a pine forest. Soil Biology & Biochemistry 32:1671�1681. McLean, M. A.; Parkinson, D., 1997b. Soil impacts of the epigeic earthworm Dendrobaena octaedra on organic matter and microbial activity in lodgepole pine forest. Canadian Journal of Forest Research. 27(12). Dec., 1997. 1907-1913. Prat, Pascale; Charrier, Marryvonne; Deleporte, Simone; Frenot, Yves, 2002. Digestive carbohydrases in two epigeic earthworm species of the Kerguelen Islands (Subantarctic) Pedobiologia. 46(5). 2002. 417-427. Reeves, Will Karlisle; Reynolds, John Warren, 1999. New records of cave-dwelling earthworms (Oligochaeta: Lumbricidae, Megascolecidae and Naididae) and other annelids (Aeolosomatida, Branchiobdellida and Hirudinea) in the Southeastern United States, with notes on their ecology. Megadrilogica. 7(10). Sept., 1999. 65-71. Reynolds, John Warren, 2000. A contribution to our knowledge of the earthworm fauna of Manitoba, Canada (Oligochaeta, Lumbricidae). Megadrilogica. 8(3). June, 2000. 9-12. Reynolds, John Warren, 2001a. The earthworms of New Brunswick (Oligochaeta: Lumbricidae) Megadrilogica. 8(8). June, 2001. 37-47. Reynolds, John Warren, 2001b. The earthworms of South Carolina (Oligochaeta: Acanthodrilidae, Lumbricidae, Megascolecidae, Ocnerodrilidae and Sparganophilidae) Megadrilogica. 8(7). May, 2001. 25-36. Reynolds, John Warren, 2003. The earthworms (Oligochaeta: Lumbricidae) of Wyoming, USA. Megadrilogica. 9(6). January 2003. 33-39. Reynolds, John Warren, 2007a. First earthworm (Annelida : Clitellata : lumbricidae) records from Wentworth township, Argenteuil county, Quebec, Canada. Megadrilogica. 11(5). SEP 2007. 58-62. Reynolds, John Warren, 2007b. The earthworms (Oligochaeta : Lumbricidae) of South Dakota, USA. Megadrilogica. 10(12). FEB 2007. 95-105. Reynolds, John Warren, 2008. The Earthworms (Oligochaeta: Acanthodrilidae, Lumbricidae and Ocnerodrilidae) of Arizona, USA. Megadrilogica. 12(11). NOV 2008. 155-166. Reynolds, John Warren; Damoff, George Alan, 2010. The Earthworms (Oligochaeta: Acanthodrilidae, Lumbricidae, Megascolecidae and Sparganophilidae) of Oklahoma USA. Megadrilogica. 13(12). MAY 2010. 173-193. Reynolds, John Warren; Jones, Alexander G.; Gaston, Kevin J.; Chown, Steven L., 2002. The earthworms (Oligochaeta: Lumbricidae) of Gough Island, South Atlantic Ocean. Megadrilogica. 9(2). May, 2002. 5-15. Reynolds, John W.; Mayville, Philip N., 1994. New earthworm records from Rainy River District in North Western Ontario (Oligochaeta: Lumbricidae) Megadrilogica. 6(2). 1994. 13-17. Reynolds, J. W., 1976. Catalog and Identification Key to Lumbricidae in Quebec Canada. Naturaliste Canadien (Quebec). 103(1). 1976. 21-27. Reynolds, J.W. 2004. The Status of Earthworm Biogeography, Diversity, and Taxonomy in North America Revisited with Glimpses into the Future.In. C.A. Edwards (Ed). Earthworm Ecology (pp. 63-74). CRC Press. Righi, G., 1989. Addition to the knowledge of Venezuelan Oligochaeta. Revista Brasileira de Biologia. 49(4). 1989. 1065-1084. Roubickova, Alena; Mudrak, Ondrej; Frouz, Jan, 2009. Effect of earthworm on growth of late succession plant species in postmining sites under laboratory and field conditions. Biology & Fertility of Soils. 45(7). AUG 2009. 769-774. Scheu, Stefan; Parkinson, Dennis, 1994. Effects of invasion of an aspen forest (Canada) by Dendrobaena octaedra (Lumbricidae) on plant growth. Ecology (Tempe). 75(8). 1994. 2348-2361. Straube, Daniela; Johnson, Edward A.; Parkinson, Dennis; Scheu, Stefan; Eisenhauer, Nico, 2009. Nonlinearity of effects of invasive ecosystem engineers on abiotic soil properties and soil biota. Oikos. 118(6). JUN 2009. 885-896. Suarez, Esteban R.; Fahey, Timothy J.; Groffman, Peter M.; Yavitt, Joseph B.; Bohlen, Patrick J., 2006a. Spatial and temporal dynamics of exotic earthworm communities along invasion fronts in a temperate hardwood forest in south-central New York (USA). Biological Invasions. 8(4). JUN 2006. 553-564. Suarez, Esteban R.; Fahey, Timothy J.; Yavitt, Joseph B.; Groffman, Peter M.; Bohlen, Patrick J., 2006b. Patterns of litter disappearance in a northern hardwood forest invaded by exotic earthworms. Ecological Applications. 16(1). FEB 2006. 154-165. Szlavecz, Katalin; Csuzdi, Csaba, 2007. Land use change affects earthworm communities in Eastern Maryland, USA. European Journal of Soil Biology. 43(Suppl. 1). NOV 2007. S79-S85. Teale, Chelsea L, 2007. A preliminary survey of the Oligochaete fauna of the Yukon Territory, Canada. Megadrilogica. 11(1). MAR 2007. 3-7.